Reading Walt Mossberg's review of Google's newly announced Chrome browser he does all the expected feature and speed comparisons between Chrome, IE, and Firefox. But no where does he mention the very real possibility that the primary motivation for Google to compete in the browser wars is to serve more of it's highly profitable ads in an ever more targeted way to consumers that "opt in" to download the Google browser. "When you type URLs or queries in the address bar, the letters you type are sent to Google so the Suggest feature can automatically recommend terms or URLs you may be looking for. If you choose to share usage statistics with Google and you accept a suggested query or URL, Google Chrome will send that information to Google as well." -- okay so not only will Google re-direct you to a page which it is not illogical to conclude will be optimized to show ads that yield the highest return to Google when clicked, but Google will also do you the favor of "sharing usage statistics" which again only help Google optimize yeild for ads served and insure bid prices that advertisers pay continue to rise. "Information that Google receives when you use Google Chrome is processed in order to operate and improve Google Chrome and other Google services." The "Google receives" link is broken in this text so I have no idea what they plan on "receiving" nor does Google explain "processed." Again, on the surface benign, but surely Google did not include this language for filler. The implication is that Google is recieving information about your browser (i.e. the pages you view, the cookies you store, downloads from websites, etc.) and is "processing" the information to optimize the ads it delivers to the browser. In fairness, Google provides links to opt-out of these "features". Throughout the copy Google provides links to "disable this feature" and refers to "incognito mode" allowing you to disable stored history of pages viewed on your machine. However, given the foggy policy statements referenced above, Chrome looks and smells a lot like adware. This is not a bad thing, but for heavens sake, I would hope Google would not perpetuate the sins of the past and at least be candid about their objective: Google wants to create a product that delivers more targeted and relevant ads that benefits advertisers and consumers alike. Yes, consumers can benefit from this approach, but only if there is full disclosure and consent. The murky language above leaves lots to doubt. Dismiss me as paranoid, but why else would Google enter the browser wars? Are they really motivated to grow market share for yet another browser--that ostensibly replicates most, if not all of the features already available in IE and Firefox? 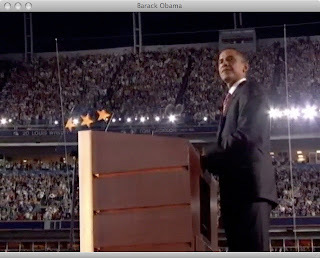 Was delighted to see Apple offer free full length video and audio downloads of Barak Obama's acceptance speech at Thursday night's Democratic National Convention in Denver. Great move by Apple to use it's market leadership to not only make a buck, but to promote the spread of democracy.